(PhysOrg.com) -- Diamond is best known for being a prized gem and the hardest cutting element available, but now thanks to research being carried out at Macquarie University it is also proving to be a super efficient laser material. 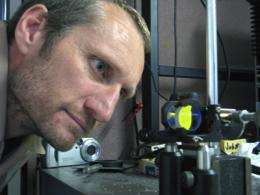 Associate Professor Richard Mildren and his colleagues at the Macquarie University Photonics Research Centre discovered it was possible to generate a coherent laser beam from man-made diamond in late 2008. They have now demonstrated diamond lasers with efficiency higher than almost all other materials. "The major achievement is that we are able to use synthetic diamond to create high performing laser devices," Mildren said. "We are now in good position to explore the highly exotic laser properties of diamond, many of which are not so widely appreciated. "For example, the speed at which heat travels through diamond is the highest of all known materials, and it is hoped that this property will enable us to simultaneously miniaturise the device and increase the laser beam power to unprecedented levels." The diamonds used in the laser research are colourless, approximately eight millimetres long, and weigh a bit less than a carat. They are grown to the researcher's specifications using a process called chemical vapour deposition that essentially creates the crystal lattice carbon by carbon atom and layer by layer on top of a large flat diamond crystal substrate. The synthetic diamond forms the core component of what is called a Raman laser, a type of laser that is optically stimulated rather than electrically powered. "Though there has been little take up of this type of diamond in the gem market, it is very well suited to our purposes. Diamonds larger than one centimetre are likely to be available very soon which will also be an advantage for our studies." Diamond is also the most transparent material known to man, in terms of the range of light wavelengths (or colours) that can pass through the material. Mildren said this would enable researchers to select from a huge range of laser wavelengths, such as in the far infrared, and hence potentially tap into a broad range of applications. "The wide wavelength or colour choice means that we can tackle key challenges facing society in several areas. I'm aiming to attract junior researchers to start investigating devices that might solve key challenges in neurosurgery, or to safely detect toxic or explosive gases from a distance, a challenge that is considered a major priority for defence and counter terrorism organisations," Mildren said. Mildren said satellite borne diamond lasers for mapping greenhouse gases in the atmosphere were also a possibility. He said it is only now - in the 50th year since the invention of the first laser - that the full potential of diamond lasers is starting to be understood. "It's a nice surprise to get a new type of laser to explore in the laser's big jubilee year," Mildren said. "Two things came together only recently. Particularly good quality synthetic diamond is now being grown in Europe; and our knowledge of laser design is improving, thanks to work being done here at Macquarie and by several groups overseas using other materials that behave in a similar way." Mildren will present his work at the international conferences, Conference on Lasers and Electro-Optics and the Quantum Electronics and Laser Science Conference, being held together in California in May. debeers already has bee calling these man made diamonds "fake" is what I've read. They have done an amazing job of making us all believe diamonds are rare and as such precious. They are beautiful but as zevkirsh said the rare part is because debeers has the market cornered around the world. So where are the numbers? I'd like to see buckyballs holding suspended liquid diamond for a liquid laser. The old always fights back with vehemence, which is why debeers will fight as hard as they can. they are fighting for their lives -Self created lives- they may be interfering in ours in their running SOP behaviors... but fight hard they will. So, in essence: Stomp on them -hard. For they are looking, themselves, to do exactly that -here. example: the first commercial synthetic diamond plant was created by an ex-US general, and he had much active duty under his belt. His security and preparations on that, ie, the security at his plant was and is massive and overpowering. The threat from the established enterprises is that big and that real. Could this also hold key to superconductor?